The combined and continued efforts of DS ISKRA are directed to achieve the greatest possible credibility, recognition, quality and increased value for its clients. In this direction DS ISKRA has moved on with implementation and certification of Quality Management System ISO 9001, while in parallel the company was equipped with the highly specialized software STRUCAD of AceCad Software Ltd, that is both very important for the designing as well as for the monitoring of a project during all stages of realization until final delivery to the customer, giving in this way dynamic and competitive advantage to the company in the field of structural steelworks industry. For achieving the best financial, technical and aesthetic results, the design efforts are incorporated in all phases of the product development, starting from the initial offer and ending with the delivery of the project to the client. The Sales Department is staffed with engineers who are experts in steel structures and pay close attention to the client needs, offering advice and solutions, concluding with the preliminary design of the project. What differentiates DS ISKRA, from its competition, is that is supported by a complete Engineering and Design Department, which is staffed with experienced professional engineers who with the help of specialized software, are able to challenge and design any complex metal structure. Engineers with vast experience are the team members of the Project Management Department, who have direct contact with all phases of the project and all the relevant information. They are responsible to manage and program the projects, using the appropriate software. The Purchasing Department proceeds with the supply of all required material. The Production Department, with its staff of highly qualified engineers, technicians and workers and by using special software programs as well as complete latest technology mechanical equipment, undertakes execution of the design, according to the supplied list of materials and drawings, programming the fabrication of the components in the production line, which is organized in the best way in order to eliminate delays and operational cost. Shipment and loading of the final products to the client and/or construction site, is the responsibility of the Distribution Department. With the arrival of the structural members and other components to the construction site, the Construction Department checks based on the provided from the Design Department material list, the quantity and quality of structural members and jointing material. Following, the experienced construction crews start erection of the building, according to the drawings and specifications, taking all necessary safety precautions. All production phases, from the material supply and production until the final delivery of the products, are quality inspected according the procedures of Quality Management System ISO 9001, and are certified by the inspectors of the Quality Control Department, in order to achieve Best Quality and maximum Customer satisfaction. 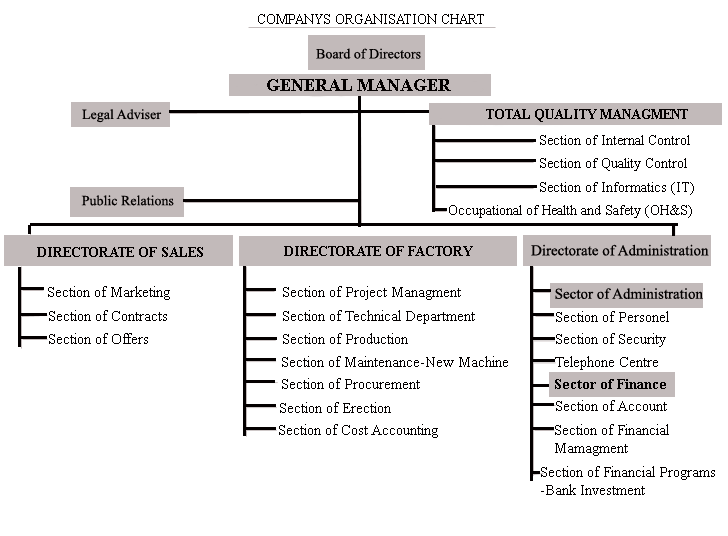 Financial Department is responsible that the planned project objectives, datelines and budgets are within the projected scope and there are provided solutions to the discovered problem areas, with the main objective being improvement of the efficiency, profitability and competitiveness of the company. The Personnel Department handles payroll and other staff issues. The well-organized Accounting Department is responsible for all the company finances, compiling and drafting periodically all the relevant data, producing financial status reports. DS ISKRA has a complete computer network with the latest technology, high definition monitors (necessary in Designing Department), scanners, laser & inject colour printers and colour plotters for drawing sizes up to A0 format.